In the new reality of storm water management and BMP’s, just getting off the ground can be a daunting task. Site design has become anything but simple. The growing use of multiple site BMP’s can drive up both project complexity and cost. 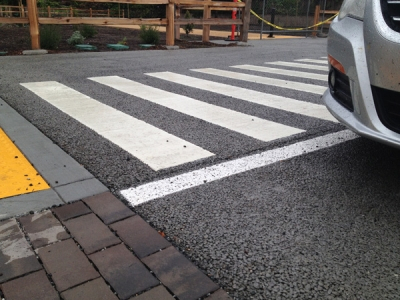 When integrated properly, pervious concrete can be an attractive one stop solution. It has the ability to function as a comprehensive stormwater system that not only reduces runoff, but can eliminate runoff entirely. Of course, like any product or process there are right and wrong ways to accomplish this goal, and knowing the difference is the key to success. Since founding Bay Area Pervious Concrete in 2005 I’ve developed a deep understanding of both the material and the process of pervious concrete installations and maintenance. I’ve worked with all aspects of pervious concrete including site plans, mix designs, equipment, installation, testing, and specification development with regional and national boards, committees and local municipalities. Achieving success is a bit like building a three-legged stool—three legs are needed to support the goal. 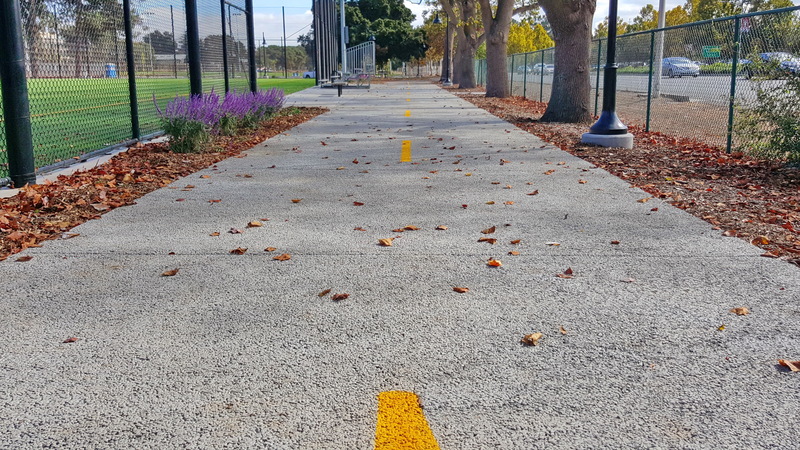 If the goal is a functional and durable permeable pavement, it needs to be supported by good design, specifications, and installation. While much can be written about all three of these, this article‘s focus is on what makes good specifications. Specs, are in a sense, snapshots, based on the most relevant information available at the time and encompass the current industry best practices for process, procedures, and materials. When there is little or no change to a product over the years, then the spec remains relevant. But what happens when things change quickly and significantly, a trend seen with pervious concrete. 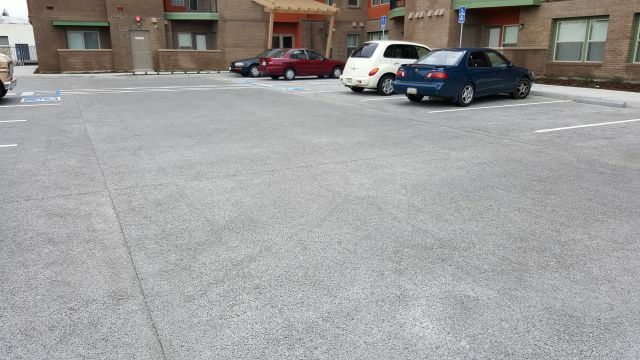 Example of raveled pervious concrete that results in poor performance.One of the major challenges in construction is the inability of documentation to keep pace with the advancement and evolution of products and processes we see in the field. This is especially true for pervious concrete, which has advanced at a revolutionary pace over the last decade. Currently one of the more exciting durability tests is doing burnouts* on the pavement, yet ten years ago the mantra amongst installers was a modest “how do I survive the installation,” because the majority of times they didn’t. Mix designs, equipment, and installation techniques were awful by current standards and it showed in pavement performance and aesthetics. This brings us to the crux of the current problem. Much of the spec language (and often entire spec documents) written in those early years of high failure are still alive and in wide use today. 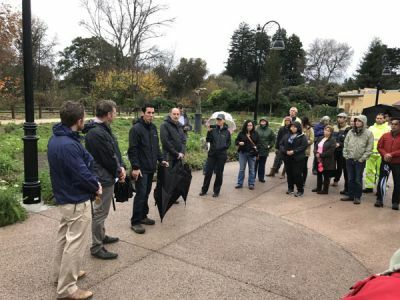 A recent example is the initial specs we received for a project in Soquel, California which we recently toured with a group of professional to share the experience. So how can we remedy this? The question you should always be asking is “Does the spec I am using promote good practices, and protect me when there is a problem?” Unfortunately, most of the previous concrete project specs I review fail on both accounts. Why? 1) They have a low qualification bar. 3) They contain inadequate acceptance standards. When the National Ready Mix Concrete Association (NRMCA) developed the pervious concrete certification program, the initial batch of qualifiers were naturally certified at the first level; technician. At this level only a written test is required with little or no field experience. Because only technicians were available, specs had to allow for them in bid qualifications. As previously mentioned, in the early days, the bad installations outnumbered the good as individuals worked through the challenges of installing a new material. But, those who were committed and stuck around eventually moved up to the second (Installer) and third (Craftsman) levels of qualification. Recognizing the need to raise the bar of installation quality ACI , who had initially supported and promoted technicians as qualifiers, removed them in 2013 allowing only Installer and Craftsman level certifications. In an ideal world, local and regional specs would follow suit. But that hasn’t been the case. From what I’ve seen, most specs still use the original language that allows technicians to qualify. A bigger problem is the cobbled together specs that simply say “installer shall be certified” or “experienced” without referring to any qualification standard or definition of experience. Specs are intended to delineate project requirements for materials, products, installation procedures and quality aspects involved with the execution of the work. Most of the pervious concrete specs that exist are prescriptive. They convey the requirements of a project through specific instructions on how to achieve them. When the means and methods are provided to the contractor this removes a degree of responsibility from the contractor and puts it on the shoulder of the specifier. 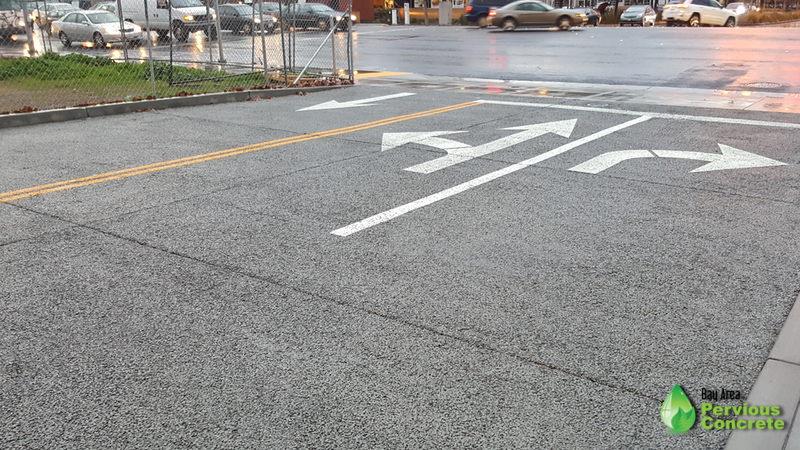 Since few specifiers are well versed in pervious concrete mix design or installation practices they routinely and unknowingly issue specs with outdated requirements. This greatly increases the odds of failure. 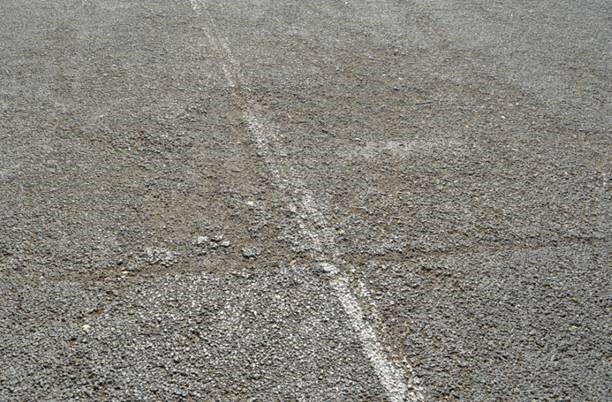 This can create a situation where the installer complies with the spec, yet produces a disappointing pavement, leaving the specifer with little or no recourse. I receive a number of inquiries from engineers when failures occur. After reviewing the specs, I often have to regretfully inform them the problem wasn’t necessarily the installer but the spec, giving them little grounds to force a repair or replacement. Performance-based specs, on the other hand, take the opposite approach and shift responsibility for means and methods to the installer by providing clear and measurable standards that must be met, without dictating how to meet them. This also benefits the project in that the installer is now free to innovate. If he can meet the spec standards using a new variation of mix or equipment while increasing quality or productivity, everyone wins. What’s wrong with the acceptance standards in most specs? Well, there are none. In the early days of pervious concrete the two most common problems, raveling and sealing, were so prevalent that no one dared address them in a spec. With advancements in mix designs, equipment, and installation techniques the industry has brought these challenges under control, yet specs still fail to address them. I’ve encountered too many badly raveled pavements where the installer told the owner “that’s normal and to be expected for pervious concrete,” yet that’s no longer the case. When pervious concrete is installed well, there should be little to no raveling or sealing and the spec needs to directly address this with defined limits. And let’s not forget infiltration, after all that is the primary function of the pavement. While some specs address infiltration, they most often require a 100” per hour rate. This might seem high, but it’s actually quite low. We’ve found a high correlation (inverse relationship) between initial infiltration performance and long-term maintenance requirements. The higher the initial infiltration, the lower the maintenance needs, so we recommend a minimum acceptable average rate of 350” per hour. Participants get a first-hand knowledge of pervious pavement design during the Calming the Storm Low Impact Development project tour.If you attended the December 15th "Calming the Storm" Low Impact Development Tour you heard me say that had we complied with the original spec issued for the project in Soquel, the pervious concrete wouldn't have the outstanding performance we witnessed that day in the rain. I had a productive conversation with the project engineer and was able to make the necessary changes for a successful outcome. However, that may not always be the case with a less experienced installer, so to avoid that altogether let's start off on the right foot with the right spec. The spec we are looking for directly address the three legs of support in accordance with current industry best practices and knowledge. The qualification bar should be sufficient to ensure highly experienced crews, and the language performance based, providing clear standards for both performance and appearance while leaving means and methods up to the installer. This provides a means of recourse to the specifier should something go awry. * http://www.bayareaperviousconcrete.com/videos/ (Bunyan Abrasion Testing) BTW, this is not an official ASTM approved test, but it sure is fun!